Alas, he wouldn’t live to find out. Twenty-two when he wrote it, he was dead at 26. But half a century since it was recorded for a game-changing Byrds album, maybe the people do feel different. A flop when it was released, “Sweetheart of the Rodeo” gained stature as the first album-length country-rock statement, creating a string of music that flourishes as Americana, and justifying a tour marking its 50th year, which made its way to the Music Center at Strathmore in Bethesda in a ringing show Monday. Roger McGuinn and Chris Hillman were the only Byrds remaining to perform it. But that seemed to fit — they were the only two members left in the imploding band when they started the project. They were the ones who hired the country-rock savant Parsons, who in turn helped steer the band to its rhinestone-gilded new direction. 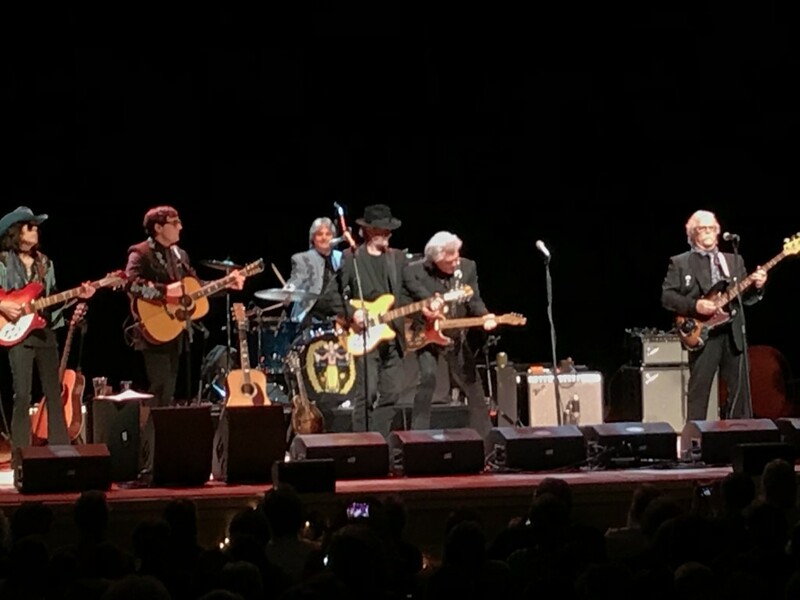 To replicate that reverent old Nashville authenticity, there was no better ally for the two Byrds than Marty Stuart and his Fabulous Superlatives. Drummer Harry Stinson had the “Sweetheart of the Rodeo” logo on his drum and a Nudie-style coat; bassist Chris Scruggs moved to pedal steel only late in the show with Kenny Vaughan providing tasty solos when needed. But mostly the guitar power was provided by Stuart, who famously also owns the very 1954 Fender Telecaster owned and used by White, who died in 1973. White and Parsons had rebuilt the guitar to raise the B string a step to play pedal-style tones — which meant the pedal steel itself wasn’t necessary. It was almost like having another member of the Byrds on board. And Stuart could also play like crazy — his intricate work done with economy and lack of visual flash. McGuinn, 76, who has toured a one man show about his move from folk to rock, helps create a narrative with the “Sweetheart” show, beginning with their scene setting version of Dylan’s “My Back Pages” and touching on different Byrds forays into country from “A Satisfied Mind” to “Wasn’t Born to Follow” before embarking on the album at hand — not played in original order, but shuffled up a bit. It’s an interesting grab bag, with classics and little-known classics given verve, from McGuinn taking lead on “Pretty Boy Floyd,” to Hillman enthusing over the title song of a Gene Autry movie. McGuinn said he didn’t get the Louvin Brothers’ “The Christian Life” when they recorded it; he said he did now. The latter also ended the LP, but in concert they chose to reprise “You Ain’t Goin’ Nowhere” with a singalong choir, as if they were still pitching the song, which only reached No. 77, as a hit. (It was the one country DJ Ralph Emery rejected after hearing 10 seconds, prompting McGuinn to describe him in the scathing “Drug Store Truck-Driving Man”). If Dylan inspired the early Byrds, and Parsons influencing the countrified turn, it was Tom Petty who revived the ringing, 12-string sound of the band in his own hits, and the encore was practically a secondary tribute to him. Stuart had a nod to Petty as well, with a terrific “Runnin’ Down a Dream” fueled by his own fiery mandolin playing. Of course it all had to end with “Turn! Turn! Turn!,” the lesson being that there was a time for everything.